In an era of widely disseminated digital images, online publishing platforms, the Small Press Project responds to a material turn for publishing. Material Publications range from low tech, quickly and cheaply produced zines to high production value, more traditional perfect bound photographic books. Publications range from low tech, quickly and cheaply produced zines to high production value, more traditional perfect bound photographic books. 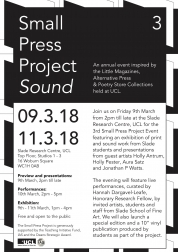 The Small Press Publications Event will host discussions about a broad range of publications, particularly in relation to the theme of Sound. There will be an opportunity to see examples of the most recent of artists’ publications within the context of the history of the medium. The event will bring together educational institutions, small press publishers, independent distributors, performers, musicians, makers and researchers to discuss the motivations and reasons behind this turn. We will consider what it means to be making material publications in 2018, and the historical, social, creative and conceptual motivations behind the independent publishing movement. 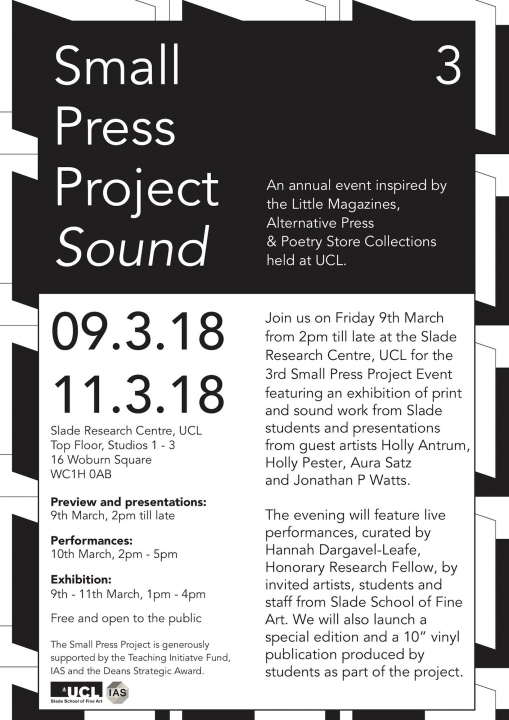 The event on Friday 9 March starts from 2pm till late at the Slade Research Centre, UCL for the 3rd Small Press Project Event featuring an exhibition of print and sound work from Slade students and presentations from guest artists Holly Antrum, Holly Pester, Aura Satz and Jonathan P Watts. The evening will feature live performances, curated by Hannah Dargavel-Leafe, Honorary Research Fellow, by invited artists, students and staff from Slade School of Fine Art. We will also launch a special edition and a 10” vinyl publication produced by students as part of the project. Aura Satz’ practice encompasses film, sound, performance and sculpture. She has made a body of works that look at key female figures largely excluded from mainstream historical discourse, in an ongoing engagement with the question of women’s contributions to labour, technology, scientific knowledge and electronic music. In her presentation she will give an overview of 3 projects made about women composers, including ‘Oramics’, an artist’s film made in homage to the pioneering electronic musician, Daphne Oram. Jennifer Pike produced the 'Computer Dances' and other works within and around a productive, shared domestic studio, printing and publishing space wherein she was the oft-collaborator, and also marriage partner of Bob Cobbing (1920-2002). Computer Dances compiles Pike's abstract notations for dance and performance: they were made in her 70's, and she created them stepping into digital working, through scans and digital drawing using a simple early Sketch-Up programme. Holly will explore how arriving at these drawings occurred through being in Pike's home and studio and how this sonically entered her 16mm/HD film, titled Catalogue (2012-14). Excerpts will screened from the film (19 minutes). There is no actual relation between concrete poetry and grime, but the mix and blend might open up affinities. For example, by concentrating on the physical substance of language, concrete poetry can, to echo Bob Cobbing, help us consider how the microphone and the tape recorder extends the human voice, teaching the human new tricks of rhythm and tone, power and subtlety’. From Flirta D’s ‘splatterisms’ to Flow Dan’s New Age Synchronised Avengers, D Double E’s ‘blukuuus’ to God’s Gift’s rhyming gunshots, this talk will not place grime in the service of concrete poetry. The evening will feature live performances, curated by Hannah Dargavel-Leafe, Honorary Research Associate, by invited artists and students and staff from Slade School of Fine Art. We will also launch a special edition and a 10” vinyl publication produced by students as part of the project and an editioned print made in honour of Mark E Smith and his inspiration Blast. Sound works will be playing in listening booths and there will be an exhibition of visual scores, moving image and printed works. The Small Press Project is generously supported by the Teaching Initiatve Fund, IAS and the Dean's Strategic Award.